Quick note: Sorry for the delay on this article. I had some “real life” get in the way that left me and this article in different time zones, so I had to re-create it from memory on a different computer. While I have no doubt forgotten something, I hope you still enjoy this “on the road edition” of (Social) Contract from Below. Welcome to another edition of (Social) Contract from Below. This week is going to be largely about the Ruric Thar “my first Commander” project. I want to talk about a few of the card choices that I made without asking you guys, as well as talk about some cards that were kept on the sidelines intentionally. One of the things I love about commander is seeing cards that, while good in two player games, go nuts in commander. The most recent example of this is the Extort mechanic and how it works exponentially better in multiplayer (seriously, if you haven’t tried out Pontiff of Blight and Crypt Ghast yet, go do it now. Those cards work how you think they do!). 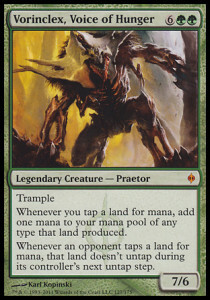 While I didn’t have access to extort (cry) I did choose to a few cards that help teach about reevaluating cards for multiplayer in Forgotten Ancient and Taurean Mauler. Are these cards little more than big, dumb beaters that will quickly draw a disproportionate amount of hate? Probably. However, if it gets a new player to see that they should not be afraid to give “bad” cards a second chance when put into a multiplayer setting, then they will have done their job. I also included Mana-Charged Dragon. While I don’t particularly like the join forces mechanic (actually that’s a lie, I just do not like most of the cards that have to mechanic and I’m not sure that there is that many other places that mechanic can go except for more of the same), I did feel it was important to reference, in at least some small way, that wizards does make cards that are aimed at multiplayer/commander. I also want to talk about some cards that I didn’t put in the deck. I’m in the process of getting ready to move which involved (unsurprisingly) packing up a great deal of magic cards. Amongst them was the pile of cards I pulled out on my collection the “might” go in Ruric. (In fairness I had also pulled a number of cards for the other generals as well.) While many of the pile made it into the deck there is at least one that I am thankful that it did not. If any of you have been missing my “Card you should not be playing” segment from last season (that will return next season, once we are done with Ruric) consider this your fix. I hate the card Vorinclex, Voice of Hunger. While I do not mind people playing mana boosters, the fact that it freezes other player’s lands keeps them from playing. If I had to sum up the social contract in one sentence it would be “If what you are doing completely stops the rest of the table from doing anything, then your deck violates the social contract. That’s all I have for this week. However, this article is not over. This week is our final week to look over the list for Ruric Thar before I get to test it next weekend. If you see any gaping holes in the deck then let me know on here. Also, since I am in the process of moving I have most of my magic stuff already packed up. To get me magic fix. I am officially declaring this week my Commandercast “ask me anything” week. If you have a question about the deck, about writing for commandercast, about judging MtG events, or about me in general, ask them in the comments and I will answer them. I’ll see ya’ll next week.